The Upper Tier is something of the shallow end when it comes to adventure in Gogarth Bay. It is reasonably easy to access along a rather treacherous path, but its non-tidal nature makes it a rather forgiving venue. Classic routes like The Strand, Park Lane/Doomsville, Winking Crack, The Cruise and Energy Crisis make this a popular area. Ideal for when you haven’t enough time to do another route on Main Cliff or you’ve got the tides wrong! The first routes on the southern part of the Main Cliff and the Upper Tier are accessed via the path/track from South Stack towards Holyhead Mountain. Just after you pass the radar station and just before you get to Holyhead Mountain a track leads down leftwards towards sea and a nice racking up spot, above a gully. The top of the gully is undercut massively and not a good place to stand and admire the view. The routes are describe from south to north as you approach them. A slight route up the walls above the base of the descent gully. Start below a 20 foot slab. 1 100′ Climb the slab and the groove on the right to a wall. Traverse right and up a small arete. Step left onto a ramp, follow this to a crack, and climb this to belay blocks on the left. 2 70′ Move over to the crack in the wall behind the belay. Climb this over blocks to the wide crack on the right, which leads to the top. Start by scrambling up to a peg belay at the foot of the obvious slabby corner left of the decent gully. Climb the crack on the right to a grassy ledge. From the LHS of the ledge head up and leftwards to the top. A thin and bold pitch taking the obvious thin crack rightwards up the once clean wall. Probably unrepeated. Start by scrambling up to a peg belay at the foot of the obvious slabby corner left of the descent gully (Dirtigo). Climb the corner for a few metres then move right to the crack. Climb the fissure to the first of 2 peg runners (serious, in-situ RP 0 on first ascent). Continue (crux) to gain the second peg. Easier climbing leads to a finish on the arête. Not as bad as the name suggests, allegedly. Takes the obvious slabby corner left of the decent gully. Start as for Psychocandy. 1 110′ 4c. Climb the corner skirting slightly leftwards around the bulge. Continue up to a grassy ledge with peg belays. 2 50′ Continue up steep vegetation to the top. Variation: The Wall Finish 2a 50′ 4a From the belay traverse right and follow a loose chimney to the top. Variation: 2a 50′ 4a Climb the slab up and leftwards to finish (recommended). The crackline in the centre of the slab left of Dirtigo. A serious pitch up the left arete of the Acid slab. Good if you like chimneys. Start at a chockstone belay beneath the right hand side of the gigantic pinnacle. 1 120′ 4c Climb the chimney until it is possible to escape to a small ledge on the left. Shuffle to the edge of the flake then climb up and left to a spike belay on top of the flake itself. 2 15′ A short scramble behind the stance leads to a second spike belay in a small recess. 3 55′ 4c The crack behind the belay. Takes the obvious twin diagonal cracks up the right hand side of the front face of the gigantic pinnacle. Start beneath the cracks. 1 120′. 6a Move up a little and make a hard move left to get established on the line. A good rest after 6 metres is followed by a baffling sequence to enter the slabby groove above. Follow this, and then the wide crack on the right to belay on the top of the flake. 2 70′ 4c Gain the crack above and follow this to finish as for The Rift. John Redhead, 4 April 1982. Second ascent Nick Dixon, 1980s. A direct finish to Strike. From the shake out on Strike make some tricky moves rightwards to a peg (bodyweight only), then move up the arête to the next peg (a real shocker!). Possible good cam placement in a pocket to the left of the second peg. Step left and climb the wall past 2 terrible pegs and possible small, but desperate to place wires, to a difficult exit onto the sloping top. Finish easily. Grant Farquhar and Clare Carolan, 7/7/94. A vague right trending depression provides the line of this serious pitch. A good selection of wires and a few slings can be placed, but few of the runners are really inspiring. 1 70′ 6a A strenuous start leads up and right to a long flat ledge (Spike runner departed, 2009). Pull up and left off the small ledge (crucial wire) before trending delicately rightwards aiming for a positive hold. A line of improving holds lead directly up to the first belay of Strike. A serious and awkward pitch. 2 35′ 6a Gain and climb the flake on the right. Follow a lichenous ramp leftwards, then go up to belay on the top of the pinnacle. 3 50′ 4c Finish as for The Rift. Ron Fawcett and Chris Gibb, 18 Sep 1978. “It is certainly the hardest route in Wales at the present time” Geoff Milburn in the 1978 Gogarth Supplement. The obvious left hand finish to Blackleg. Sustained climbing with poor protection. More serious then Panorama (a 1970s TV show). Follow Blackleg past the flakes to a relatively good nut placement. Move up and left to a poor peg. Continue with difficulty to gain the vertical crackline above and follow this to join Strike. Finish up this. Grant Farquhar and Clare Carolan, 26/7/93. Second ascent Mike Twid Turner, 1994. On-sighted by James McHaffie, 2003. Start left of Blackleg, directly below a line of pockets in the middle of the wall. Hard E6 with the peg, It has now been re-climbed (by Craig Smith, ground up, 2003) without the emasculating peg- it stuck out a lot! – and is now bolder. 1 120′ 6b Climb up to a large pocket (large nut). Technical moves lead slightly leftwards then rightwards (or is it rightwards, then leftwards?) to regain the line of pockets and soon some gear. Follow pockets and a vague crack line to a small overlap and continue in the same line to an old peg. Step right then go easily up to belay on the flake. 2 50′ 4c As for The Rift. Jim Moran, Al Evans 30 May 1978. FFA John Redhead 6 July 1980. Takes the chimney up the left side of the huge pinnacle. Start below a crack at the foot of the slabby corner to the left of the pinnacle. 1 70′ 4c Climb the crack and continue up the chimney to sloping ledge, and belay. 2 60′ 4b climb the chimney to the top of the huge flake. D E Alcock, D Potts (alt) 24 April 1966. Start at the bottom of the slabby corner as for Bloody Chimney. 1. 100′ 5b Climb the slabby corner until a thin crack in the right wall can be reached at 25′. Follow this (a little fragile) moving right then back left, and continue to a pinnacle, where a short descent right leads to a belay in Bloody Chimney. 2. 110′ 5b Return to the pinnacle and follow grooves and cracks to a ledge. Another crack, up left leads to a niche. Continue to the top. L E Holliwell, F Quigley, L R Holliwell, 4 Nov 1967. A worthwhile route starting as for Bloody Chimney at the foot of the slabby corner. 1 120′ 4b Follow the corner for 30′ then go diagonally leftwards across the slab to reach short cracks in the left wall. Climb these to a ledge and spike belay. 2 100′ 5a Step down and traverse across the steep wall on the right to reach a big spike in the corner. Finish up the main groove above. A Williams, B Royal, 1964. Follow Pantin p1 to belay at the start of the thin crack, on the wall to the right of the short cracks of Pantin. 1 90′ 5c Follow Run Fast, Run Free to below the obvious pod. Traverse delicately right on quartz hold to gain rattley flakes. Follow these up rightwards to a crack which leads to a good stance. 2 35′ 4c From the left hand end of the ledge, folow the obvious leftward slanting crack to the top. Climb the soaring crack trending left then up to an obvious pod. Continue past a poor PR, taking care with a loose flake, then step right to gain the continuation crack which leads to the top. D Knighton, J Girdley (2 rest pts) 27 Oct 1978, FFA Willie Todd or Pete O’Donovan 1980. Louise Thomas on Run Fast, Run Free. Photo Ray Wood. The original aid route of the wall awaits a free ascent. Shares some common ground with the next route. 1. 35m 5c. Start as for Run Fast, Run Free follow the initial crack to the pod. Move leftwards to another thin crack. Ascend this for 2m then move left to a corner. up this to join Pantin. 2. 12m. Finish up the broken chimney on the right. P. Seramur, D. Durkan A2 22 Nov 70. Dave Knighton and Dave Cronshaw (1 point) 2 Oct 1978. The golden corner left of Run Fast, Run Free. Start left of Pantin. Follow Pantin p1 to belay below the short cracks. Gain a shallow depression just left of Run Fast, Run Free. Climb the depression and wall above to reach a large hollow spike, peg out left. Ascend the corner to the overlap which is passed on the right. Continue for 15 feet before moving left into a chimney and finish up this. Dave Knighton and Dave Cronshaw 5 Nov 1978. A good route taking the left edge of the Pantin Slab, and arête above. Start at the edge of the slab, left of Dangerous Rhythm. 1 140′ 4c Climb up and right for 15′, then back left to gain the arête at a small bulge. Follow the crack up the edge of the slab then take alight groove leading to the skyline. Step right and go up the crack to belay at the top block. 2 85′ 5a Move down into a chimney and climb the crack in the back wall, which is actually the right hand side of the flake. From the top of the crack step right across a steep wall and climb the groove by its left branch. Step right again to ledges and go up easy cracks to the top. D Durkan, P Sandall, P Brown, 19/20 Aug 1970. 1 50′ 4a The groove, on the left of the flake, is climbed to a belay on top of the flake. 2 80′ 4b Cross rightwards for 10′ and climb a short crack up onto the edge of the Pantin Slab. Climb rightwards to reach short cracks in the wall above, junction with Pantin. Take the cracks to gain a ledge and spike belay. 3 80′ 3b Climb the obvious broken corner on the left. Rowland Edwards, J Fletcher, 22 May 1966. The crack 6′ right of the normal start leads past a bulge to the stance on top of the flake. Can be combined with Force 8 to give a good link up that is pushing E1. Rowland Edwards, J Hutchinson, 14 Nov 1967. A varied route linking a series of pitches up the arete on the left of Puffin. Down and L of Puffin are some large blocks below a groove. 1 80 feet 4b. Climb the groove and steep crack to the top of a pinnacle and belay. 2 30 feet 4c. Climb the crack behind the belay to take a stance on the edge of the upper slab. 3 70 feet 5a. Step right and go up a short steep crack until it is possible to move out on to the wall on the left. Climb this (peg?) and make an awkward step left onto a small brown slab. Move left and then up vegetated ledges to a large spike belay. 4 80 feet 4c. Move up to the foot of a crack in the wall above. Climb this to a flake and finish up the wide crack on the left. Rowland Edwards, J Edwards, F Hutchinson 7th Nov 1967. Climbs the blunt arête left of Puffin. Down and L of Puffin are some large blocks below a groove (Campion HVS). Start by a pinnacle up and left of these. 1 90′ 6c Gain the top of the pinnacle and step on to the arête. Climb this on the right, past 2 peg runners. Swing round left and climb the blunt arete direct (crux) to a desperate barn-door slap to reach a good hold in a serious situation. Continue easily up the rib to a belay. 2 90′ 4c Slabs and vegetated ledges lead to the top. Paul Pritchard, Crispin Waddy, 3 June 1988. Second ascent by Mike Twid Turner, 1989ish. To the left of Hang Ten.. is an impressive orange-tinged wall taken by The Cruise. Left again is the towering continuation of this wall, cleft by the striking fissure of Winking Crack. Excellent protection ensures the popularity of this fine crack. Scramble up right from the path to a nut belay in a corner. 1 120′ 6b Climb the left arête to a small ledge beneath the crack. Follow the crack, 2 PRs, to a shake out just short of the chimney above. Climb the chimney. FFA Jim Moran, Paul Williams, J Sonczak, 1984. An indirect on The Cruise. Follow The Cruise to the rest below the final pod. Thin moves out left past two poor rusty pegs through the scoop lead to a break and a vertical crack that leads to the ledge. Mike Twid Turner and Louise Thomas, 2002. Also recorded by the same team under the name; The Prawnbroker. 1 60′ 5a. Follow Winking Crack p1 to belay at the base of the corner. 2 40′ 5a. Climb the corner for a little way until the shallow groove in the left arete can be gained. Climb this to rejoin Winking Crack at the block belay (possibly common with Blue Oyster Cult?). 3 60′ 6b. Gain the prominent crack directly behind the belay and follow it to a horizontal break. Traverse right, crux, passing the old aid point (Rurp!! Good gear before traverse but big swing if **** up) to reach a flake slanting away up right. 4 60′ 4c. Broken rocks lead to the top. Dave Cronshaw, Dave Knighton AL (1 or 2 pts aid) 21 Oct 1978. FFA Chris Parkin & Frazer Ball 1991. This line is based on the right hand crack. Follow Winking Crack to the top of pitch 1, possible belay. Step into the crackline on the right and follow this to the top. Mike Twid Turner, Louise Thomas, 2006. Takes the striking cracks in the towering wall. Scramble up 30′ to a good ledge below a short wall. 1 100′ 5b Go up a short easy groove before moving left around the arête (start of The Cruise) to gain the obvious corner on the left. Climb this until a stance and block belay (old tapes in place) can be reached on the left. 2 120′ 5c Walk to the left and climb the crack in the corner. Where the crack divides follow the left branch. At a small overhang move left then step back right following cracks to the final offwidth. Layback or thrutch, it’s your choice! Joe Brown, Allie Cowburn (6 pts) 5 June 1966 FFA Jack Street. Also climbed free in Autumn 1967 by Richard McHardy and Tut Braithwaite. Another eliminate based on the corners left of Winking Crack. Start beneath the corner left of the start of that route. 1. 40 feet 5b. Climb the corner to join and belay on Winking Crack. 2. 60 feet. 5a. Move left around the corner to a ramp/groove and climb this to the stance atop pitch 1 of Winking Crack. 3. 100 feet. 5c. Climb the corner above and turn the arete. Continue up to rejoin and finish as for Winking Crack. Dave Knighton, A. Hyslop, M. Tuerney. 22 April 1978. Plugs the once brushed but now lichenous gap between Winking Crack and Blind Pew. Start from the stance atop Blind Pew pitch 3. 1. 45 feet. 6a. Step right to a peg then climb straight up to an overlap (peg). Climb rightwards with difficulty to a good hold then follow a leftward slanting crackline past another peg to a good belay. 2. 30 feet. 5a. Climb the slab on the left to finish up the short headwall crack. Dave Knighton, Dave Cronshaw 22 Sep 1978. The steep broken rocks between Winking Crack and the back of the bay are split by a line of deceptively easy looking grooves and cracks. Start at the foot of a short wall, split by a thin crack, about 10 feet right of the corner. Some of the pitches could probably be run together. 1. 30 feet 4c. The crack leads to a ledge, belay below the left hand groove. 2. 50 feet. 5b. Climb the initial groove and easier one above to a good stance. 3. 50 feet. 5b. The overhanging crack. 4. 40 feet. 5b. Continue up the crack which is more difficult than it appears, to another good stance. 5. 70 feet. 4c. Climb the LHS of a detached flake and finish up the grooves and broken rock above. Joe Brown, J. Cheesmond 23 June 1966 (10 points) FFA Dave Knighton and Dave Cronshaw 12 Sep 1978. Good climbing up pockets on the first pitch but a friable and serious second pitch. Scramble up to a ledge left of a short wall split by a crack, right of a corner. See Ground Up Gogarth North p72; “a committing and fairly dirty prospect”. 1 80′ 6b Move boldly left around the arête and go up to the first line of pockets. Continue in the same line with increasing difficulty until it is possible to move right to a ledge and pinnacle belay. 2 80′ 5c From the top of the pinnacle climb the flaky crack until scary moves up and slightly right lead to a ledge. 3 40′ 4c Climb a short groove on the right to a ledge, trend right up a short slab into a corner. Finish up the easy crack. Martin Boysen, D E Alcock, D Jones (3 pts) May 1971. FFA Alec Sharp, 1983. The excellent first pitch offers sustained, well protected climbing. Start with a 30′ 4a scramble up a groove taking a belay beneath a corner (Crowbar). 1 80′ 6b Climb the short crack in the right wall, then up right to a PR. Trend back left to another PR in the depths of a pocket. Follow the faint crackline to a PR high on the right, before a tricky move left gains a good hold above. Traverse right until moves up and right lead to a junction with Fifteen Men etc. in a corner on a sloping ledge. 2 80′ 5b Climb the crack to the top of the pinnacle/flake, PR. Follow the flaky crack to a ledge. J Moran, A Evans (led pitch 3), G Milburn (1 pt) 8 July 1978. FFA R Fawcett Jan 1980. The obvious series of impending grooves in the back of the bay. A gymnastic climb which is unfortunately grassy and often damp. Scramble up to take a belay at the base of the first groove. 1. 50 feet 4b. The groove leads to a good stance. 2. 40 feet 4c. Climb the overhanging crack to the next belay. 3. 90 feet 5b. Climb the overhanging groove until the angle eases below an overhang. Turn this on the left and go up to belay on the ledge above. Scramble off. Doug Scott and Bill Cheverst, 21 May 1966. Eliminate climbing between the neighbouring routes. Start as for Crowbar. 1. 80 feet 5a. Follow the first pitch of Crowbar then move left to climb the wall to a large ledge below the groove in the back wall. Climb this, stepping right to the belay of Crowbar. 2. 90 feet. 6a. Move back left from the belay. Climb diagonally rightwards on steep rock until forced left to a small pillar. Forge rightwards again to a ledge. Finish leftwards to easy ground. Jim Moran and Geoff Milburn, 24 July 1978. The left edge of the bay is bounded by a huge pinnacle known as Shag Rock. A fairly serious route taking the shallow grooves up the L side of the bay. Start just R of Shag Rock. 1 80′ 5a Climb the short steep wall then move rightwards onto a ledge. Follow a crack to a second ledge and peg belay. 2 100′ 4c Go up the ramp on the L to gain a scoop leading to the top. L E and L R Holliwell, 15 Oct 1967. The arete above Shag Rock Start as for Black Spot. 1. 80 feet. 5a. Climb the short step wall then move left to climb the wall to a sloping ledge. Follow this right to belay on Black Spot. 2. 120 feet. 5b. Traverse back left and continue to a crack near the arete. Climb the crack past 2 pegs and finish up the arete above. B. Wintringham, M. Wintringham 16 March 1978. Climbs the pinnacle starting inside the chimney behind, near its right side.Chimney up and pull up to a ledge on the arête. Climb this and take the last bit on the inside face, PR, with interesting moves to reach the summit. Descend by abseil. M A Boysen, B Ingle (1 point) 4 April 1964. Mike Twid Turner atop Shag Rock. Photo Ray Wood. Spirals up Shag Rock. Start beneath a right trending crack in the front face. Climb this to ledges. Take the crack above to the slab. Follow the slab leftwards past a peg to gain the arete. Move around the arete to gain and follow a ledge to the other arete and climb this to the top. D. Knighton, B. Conlon 30 Sep 1978. Left of the Shag Rock pinnacle is the very popular Central Park wall. Left of centre is the stunning thin crack of The Strand. Takes the groove up the R edge of the Central Park Wall. Start in the chimney formed by the left edge of the Shag Rock pinnacle. 1 130′ 5b/c Chimney up until it is possible to to pull boldly into the groove running up and leftwards. Follow the groove over 2 bulges to a stance and peg belay. 2 20′ 5b Climb the short wall above to the top. Scramble to belay at the back wall of the slope above. M A Boysen, M Yates, 14 May 1966. Reasonably clean (July 2009) but would benefit from more traffic to prevent it from deteriorating into a dirty grass fest. Start at the base of the chimney as for Fifth Avenue. Enjoyable with a straightforward short crux section. 1 100′ 5b Step left and climb to the top of the dirty flake. Ascend the grassy wall above, moving right onto the ramp of Fifth Avenue above the bulges. 2 50′ 5c Move up and climb the steep crack in the right wall to a grassy exit onto the arete. Al Evans, Jim Moran (alts) Dave Knighton 27 May 1978. 1 130′ 5a Keeping left, climb to the top of the grassy groove and move right to boldly climb some thin cracks. Climb a right trending groove above to a peg belay at the top of the groove on Fifth Avenue. – belay half way up ramp of 5th avenue. 2 30′ 5a Go left from the belay and climb a series of flakes to a finish near the top of Central Park. Belay here or, better, well up the slope above. Alternative description: climb directly up the left trending groove, after about 20ft head up left on blocks to the ledge below the crack of Street Survivor P1 (wires) step right crux and follow thin cracks past some hollwo blocks/spikes to gain the right trending groove that leads to the spike belay of Fifth Avenue. Frank Cannings, D G Peers, 15 April 1967. Pitch 2 Frank Cannings, T Lewis, 9 March 1969. Start directly below the final crack of Central Park. 1 80′ 4c. Climb the wall and crack which leads directly up to the stance on Central Park. 2 95′ 5c. Move up the top crack of Central Park for a few moves then move left (awkward) to gain flakes out the wall, peg missing. The steep shallow groove above leads to the top. Belay way back. Dave Knighton, J Tout, 27 March 1978. Takes the obvious wide crack in the upper RH side of the wall. Start in the small niche on the left of the short rock traverse on the path. 1 100′ 4c Climb the slabby wall on the left to reach a shallow groove. This leads to a ledge on the left. Move up right then take the obvious left trending line and steep groove to a wall. Go up this to an old PR below an overhung niche. Traverse right to belay beneath the wide crack. 2 100′ 5a Climb the crack past a couple of tricky moves near the top to reach a ledge in niche. A belay can be set up here. Scramble up steps in the steep grass above to reach easy ground. P Crew, D Alcock (alt, 10 pts) 14 May 1966. An intimidating first pitch and enjoyable second pitch. The crux is easier for tall climbers. 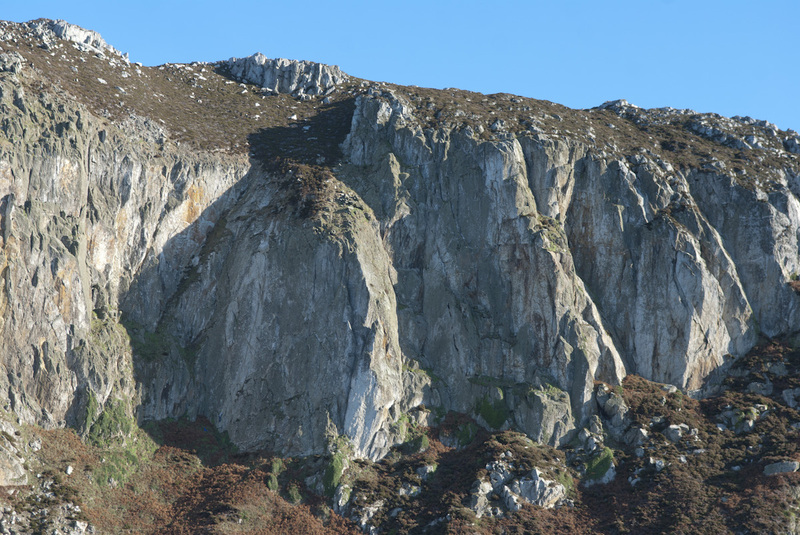 See Ground Up Gogarth North p78; “Overgrown….pegs and holds have crumbled away….upping the grade…grass slope at the top of the route is very steep and doesn’t offer much in the way of secure belays….pre-placed abseil rope recommended”. 1 100′ 5b Follow Central Park for 50′ until it is possible to move right and climb a thin crack direct to the Central Park belay. 2 90′ 6a/b Follow the obvious diagonal thin crack out left to a large pocket (good nut). Climb to the top with difficulty. J Moran, D Knighton, A Evans, 27 May 1978. Both pitches have been affected by rockfall (2008). Ben Wintringham, Marion Wintringham (1 point aid) 26 Aug 1977. FFA Alec Sharp 1977. Well protected sustained climbing up the striking crack on the brushed wall. Low in the grade. Start below, and a couple of metres left, of the crack. 1 140′ 5b Climb up rightwards to reach the crack. Climb it to a peg belay below a short slab. 2 20′ 4b Climb the broken slab above then follow steps up the steep grass to belay at the far back of the wall. Ed Drummond, 1 Oct 1967. Second ascent Richard McHardy and Dave Little, 1967. Start as for The Strand. 1 90′ 5b Climb diagonally up R to the crack of The Strand. Follow a line of holds L to the bulge. Move L and up, then back R into the crack and continue to good PBs and a stance at the top of the flake. 2 70′ 5b A fine and exposed pitch. Climb the narrow ramp on the right with difficulty (PR), then a short crack to a PB on the broken slab at the top of The Strand. 3 20′ 4b As for The Strand pitch 2. L E and L R Holliwell (pitch 1), A G Cram, M Yates, J Yates (pitch 2), 1967. 1 90′ 5b. Climb diagonally up right to the crack of The Strand. Follow a line of holds left to the bulge. Move left and up, then back right into the crack and continue to good PBs and a stance at the top of the flake. Pitches 2 & 3 have little merit and are overgrown. 2 90′ 5b. Continue in the same line, awkward at 15′, trending left into a groove. Climb the groove and move left to a stance and belay in the corner. 3 40′ 4b. Climb the easy slab to the top. Belay well back. LE and LR Holliwell 22 Oct 1967. Start up and left from the base of The Strand. 1. 100 feet 5c. Climb up to clip a peg. Move right across Park Lane and climb the RHS of the flake to the belay. 2. 60 feet 5c. Follow Park Lane a short distance until it is possible to step right and climb flakes (peg) and the slab above to the top. Belay well back. B Wintringham, J Brown (2 points aid) 24 July 1978 FFA A Sharp, S Lewis, P Williams Aug 1978. This starts at the extreme LHS of Central Park wall, by a large pinnacle, and goes diagonally right across the upper part of the wall to finish in the same place as The Strand. A rather overgrown and undistinguished first pitch. 1. 120′ 5b. Climb a vegetated broken groove to grassy ledges in the right hand corner of the amphitheatre (possible belay). Traverse diagonally right across the wall and up to the belay of Park Lane. 2 70′ 5b. A fine and exposed pitch. Climb the narrow ramp on the R with difficulty (PR), then a short crack to a PB on the broken slab at the top of The Strand. 3 20′ 4b. As for The Strand pitch 2. M Yates, AG Cram (AL), Judy Yates 19 May 1967. Takes the line of cracks up the LHS of Central Park wall. Start as for Doomsville. 1 55′ 5a. Climb the groove as for Doomsville, moving left 10′ below it’s top to belay in the grassy corner. 2 110′ 5a. Continue up the cracks above. 3 50′ 4b. as for Park Lane p3. CJ Phillips, D Cuthbertson and L Dickinson 16 March 1969. An impressive girdle of Central Park wall. The line is intricate and has been affected by rockfall on Hyde Park. Start as for Fifth Avenue. 1. 130 feet 5a. Climb to the first bulge of Fifth Avenue. Move left, then down and across with difficulty to a small spike. Follow the slanting cracks leftwards to a big spike on Times Square and continue with difficulty to belay at the foot of the final pitch of Central Park. 2. 140 feet 5c. Reverse the traverse of Central Park to the foot of the short groove. Climb this to a good spike at it’s top. This area has been affected by rockfall. Traverse left to The Strand and downclimb this for 15 feet until it is possible to traverse across to the flake on Mayfair. Follow this to the stance. 3. 90 feet 5b. Park Lane p2. 4. 40 feet 4b Park Lane p3. Ed Ward-Drummond and Simon Brown (4 points). Nov 1967 FFA P Whillance, D Armstrong 1977. The following routes start from the steep vegetated amphitheatre up and left of the Central Park Wall. It’s difficult to get to so not popular. The lower section of the climb goes up the obvious rightward slanting break. Loose but interesting. Start from a pinnacle almost in the centre of the amphitheatre, at the foot of the break. 1. 70 feet 5a. Climb the broken groove to a ledge, then continue up the prominent diagonal break to a small stance. 2. 90 feet 5a. Climb the groove and the ramp on the left, then traverses left to a light coloured groove. Follow this to the top. LE and LR Holliwell 7 Oct 1967. A serious way up the wall right of Amphitheatre Wall. Start at a belay right of the corner of that route. 1. 60 feet 6a. The crack in the red wall right of the corner. 2. 100 feet 5c. The groove above. M Crook, D Kendall, 8 Feb 1989. The broken corner on the left of the amphitheatre has a very loose and scary top pitch. M Boysen, C Rowlands 10 May 1964. The dog leg crack system right of The Cracks. D Knighton, D Cronshaw, 1979. A fine route, making the dreadful approach almost worthwhile (maybe). Start on the left side of the bay beneath a system of clean cracks. 1 150′ 5a Climb the cracks, medium and large friends useful. Serious. Start 20 feet down and left of The Cracks. 1. 100 feet 6a. Climb the slab (peg) to to the large ledge and belay on The Cracks. 2. 90 feet 5a. Finish up the crack system 10 feet right of the top pitch of Ceilidh. P Whillance, D Armstrong 30 March 1978. Moving left from where the amphitheatre ends, the crag steepens and becomes more continuous. The broken grassy ramp running along the base gradually rises until it eventually sweeps up to divide the Upper Tier from the Main Cliff just beyond the corner of Bezel. This climb takes the steep wall between Amphitheatre Wall and the yellow scar. The climbing is very exposed and the rock needs some care. Start at the foot of a groove, just left of a little ivy coloured buttress, at the bottom right hand corner of the wall. 1. 60 feet 4a. Climb the groove, keeping to the left to a stance on top of a block. 2. 30 feet 4c. Step right into a deep crack and climb this for a few feet. Move right over the bulge and up to a poor semi-hanging belay on the edge of the wall. 3. 90 feet 5c. Climb the steep ramp leading diagonally leftwards to a peg runner. Step left and climb to the top of a loose flake. Climb the shallow groove and the small overhang and continue more easily, trending left, to a large ledge. 4. 80 feet 5a. Climb to the left to below a large pinnacle. Traverse right for 20 feet and climb a crack on to a narrow ramp leading leftwards. Climb this to a large spike and then left to a small spike, Continue straight up to finish. AR McHardy, P Crew (AL) 11 April 1966. A fine adventure route of considerable character requiring a determined approach and a knowledge of Italian pornographic literature. Start below the overhanging wall left of Ceilidh. 1. 60 feet 6a. Lieback on fins to gain the crack and yellow niche above (peg). Exit rightwards (peg) at the top and belay at a block. 2. 30 feet 5b. Climb short wall and fine crack to a poor semi-hanging belay on Ceilidh. 3. 90 feet 5c. Ceilidh pitch 3. 4. 80 feet 5c. Climb the corner directly to join and finish as for Ceilidh pitch 4. M Crook, D Kendall (AL), J Tombs, 29 Sep 1987. An intricate line up the wall on the right of the rock scar, climbing the upper part of it. Start just right of a small pinnacle at the foot of the scar. 1. 60 feet. Climb easily to the top of the pinnacle and turn a little overlap on the right. Move up left for a few feet, then step right across an overhang into a broken groove. Climb this to belay on the stance of Ceilidh. 2. 100 feet. Climb the short steep wall on the left with difficulty, then trend leftwards up the obvious line to a pinnacle on the edge of the yellow scar. Move up onto the scar, traverse left, move up to the right and then follow the line of big holds leftwards to a small stance on a pinnacle. 3. 80 feet 5a. Climb the corner on the right to the top of the large pinnacle and down the other side to join and finish as for Ceilidh pitch 4. LE and LR Holliwell 1 Oct 1967. Start as for Yellow Scar. 1. 100 feet 5c. From the pinnacle, climb straight up cracks in the steep wall to an awkward mantelshelf at the top. Continue up a short groove and swing right to belay on Ceilidh. 2. 90 feet 5c. Ceilidh pitch 3. 3. 80 feet 5a. Ceilidh pitch 4. Rediscovered as Hard Animals by Martin Crook & Noel Craine 11/10/87. Monsoon E2 5b 200 feet. Takes a line to the left of Hurricane. Mike Turner, Simon Hale 2002. The arete right of The Gauntlet. Mike Rwid Turner, Louise Thomas, 1990s. Start in a shallow groove directly below the crack/groove line L of the huge, yellow, rock fall scar. This route has been the scene of a fatal accident. Make sure you have a sound belay before embarking on the first pitch. 1 70′ 5a Climb the groove (PR) and over the bulge (crux) to better holds.Continue up until it is possible to move right up the steep wall to a small stance and PB. 2 70′ 4b Up the groove on the L for 30′, then right into another groove which leads to a PB on the right. 3 70′ 4b Traverse left to finish up the steep corner crack. Belay well back. P Crew, B Ingle (alt) 2 May 1964. The original final chimney disappeared in the 1969 rockfall. The finish as described was climbed by T. Herley and Miss J. Baldock in 1967. Dirty. Start between The Gauntlet and The Ramp. 1. 145 feet 6a. Climb the vague line in the middle of the wall for 60 feet then traverse right to the arete (possible belay on The Gauntlet to the right). Climb the arete (crux) past a peg before going back left across two shallow grooves to the belay ledge. 2. 45 feet 5b. Climb directly from the RHS of the ledge to finish up the slabs above. Lawrie Holliwell, John Kingston (1 point aid) Oct 1971 FFA Andy Pollitt, Norman Clacher 11 Oct 1981. Appears to have suffered rock fall, top out very loose. Takes the steep grey ramp up the wall L of The Gauntlet. Start at a pinnacle below the ramp. 1 100′ 5a Climb the pinnacle then step R to a ledge (can be hazardous during nesting season!). Up the corner (PR at 20′) then climb the slab to some spikes on the L. Pass the bulge in the corner (crux) and continue to a large spike at the top of the ramp. Traverse easily L to belay below a steep corner. 2 80′ 4c Climb to the top of the crack in the corner. Make a blind move R into a bottomless chimney (airy and tricky) and up this more easily to finish. Pete Crew, Miss J Baldcock, 24 April 1966. A strenuous route with a fine sustained first pitch. Start beneath the RH of two wide cracks a little left of The Ramp. 1 90′ 6a Climb the crack direct to belay on The Ramp. 2 100′ 5b From the righthand end on the ledge go right into a bottomless groove. Go up and step left to a thin crack. This leads to a slabby groove on the left which is followed to the top. P Whillance, D Armstrong, 1 May 1978. Start beneath the lefthand of two wide cracks a little left of The Ramp. 1 90′ 6a Climb narrow slabs until it is possible to enter the crack on the right. Climb this to the stance on The Ramp. 2 80′ Climb shallow cracks above, finishing up chimney. E Drummond 9 March 1969 (4pts). FFA R Fawcett 1980. Originally claimed as “Gael’s Wall” in 1967 as part of “The McCallum Affair“. An early example of ballpointing. Juggy blob hauling and pinching up the wall between Afreet Street and Fail Safe. Start as for Afreet Street, stepping left onto the ramp of Fail Safe. Follow the curving undercut feature, past a good small wire, then go straight up the wall to an obvious large chickenhead ledge. An exciting mantle onto this leads to a groove and flared crack which takes you to the exit move of Fail Safe and its belay. The second pitch of Energy Crisis gives a balanced finish. Tim Neill, Jon Garside, Sue Savage, 31 May 2002. Takes the wall L of Afreet Street. Powerful climbing with some long reaches and a difficult exit from the top of the first pitch. Protection is adequate but not generous. Start beneath the LH of two wide cracks a little L of The Ramp. 1 90′ 5b Climb narrow slabs, past a quartz spike, to reach the OH, many slings required. Move R (hard) and climb small ledges to gain the belay on The Ramp. 2 80′ 5a Finish up The Ramp pitch 2. D Alcock, P Crew (alt), 7 May 1966. A good route on reasonable holds which takes the steep corner crack running up to an overhang above the foot of the slab which defines the left end of the Upper Tier. Start beneath the crack. 1 120′ 5b Steeply up the lower wall to the base of the crack. Climb this using large holds on the left wall and make a tricky move over the overhang. Continue more easily to a good ledge on the left. 2 30′ 4b Finish up the crack just left of the belay. A Sharp, S Humphries, 6 Feb 1975. Start at the end of the path at the foot of a curving groove a few feet left of The Eternal Optimist. 1 50′ 4b Climb a small pinnacle on the left to reach a diagonal crack in the slab up right. Cross the slab on the left and up to a small ledge below the groove – PBs. 2 80′ 5a Surmount the bulge and follow the groove above until it is possible to move right to a stance. 3 30′ 4b Finish up a short crack on the left to the top. B Ingle, P Crew 25 April 1964. The right hand crack between Bezel and Sulcus is poorly protected. 1 15m 4c. Start right of Bezel. Climb the prominent quartz vein in the slab, cross Bezel leftwards to gain and follow a right trending crack to rejoin Bezel at the stance. 2 37m 5b. Step left and climb the crack to gain a prominent V-niche on the left. Continue more easily to the belay ledge. A roped scramble exits via the easy rocks on the left. Al Evans, Jim Moran, 5 Jul 1978. The left hand flake crack between Bezel and Sulcus provides a serious outing. Originally graded E1 5a. From the pinnacle just left of Bezel, follow Sulcus to a ledge at 9m. Climb the flake crack to reach the V-niche on Cartwheel and finish up this. Jim Moran, Al Evans, 5 Jul 1978. Follow the obvious crack in the arête left of Bezel. Start from the pinnacle of Bezel. Follow the crack as far as the overhang and move left around it into a niche. Step left then go up to spike belays. Finish up broken ground. LR Holliwell, J Fitzgerald, 6 July 1969. .
A girdle traverse of the Upper Tier that is crying out for a free ascent. 2 5c. Cross the pinnacle to gain Bloody Chimney. Surely an excellent pitch. 3 5b. UFO p2 to a ledge. Block belay. 4 5b. From the LHS of the ledge, traverse past a peg to gain a small pinnacle in reddish rock. Continue left past another (hidden) peg to gain the corner of Canned Laughter. Climb this, moving left into the corner of Pantin. Descend and cross to a spike belay on the left. 5 4c. Diagonally leftwards for 15m to a quartz ledge on the skyline. 6 5b. Climb past a peg to gain Winking Crack. Follow a crack leftwards to a steep crack parallel to the top of Winking Crack. Climb this. 7 4c. Descend the broken crack and ramp on the left to a corner. Descend the slab. Go round the arete to a groove and on to a quartz ledge. Belay on the grass below. 8 5a. Climb the wall behind the stance, trending left to a small bulge near the top. Surmount this and and scramble to the final belay. D Durkan, M Brown, J Baker (12 pts aid) 24/29 July and 30 Aug 1970. A 10 pitch girdle of the RHS of The Upper Tier. D Durkan, D Williams 27 July 1968. A 6 pitch girdle of the LHS of The Upper Tier. A Wilmott, HJ Spring (2 points aid) 14/15 April 1968.